I’d Rather do MATH THAN METH! From 1942, the Nazi leader Adolf Hitler received daily injections of Crystal methamphetamine from his personal physician, Dr Theodor Morelll. methamphetamine is a stimulant…. methadone is a narcotic… but the Nazi’s came up with them both…. Methadone was, indeed, discovered in Germany – in the late 1930’s. Two scientists, Max Bockmühl and Gustav Ehrhart, working for the large German chemicals conglomerate IG Farberindustrie at Hoechst-Am-Main, were exploring synthetic (man-made) compounds with a structure similar to Dolantin ®. This was an opioid analgesic discovered earlier at the same company (and later marketed as Pethidine ®, Demerol ®, and other brands). few acknowledge that today (4/20) is also Hitler’s birthday. Hitler used meth… I’d rather smoke pot and do math than emulate hitler any day! 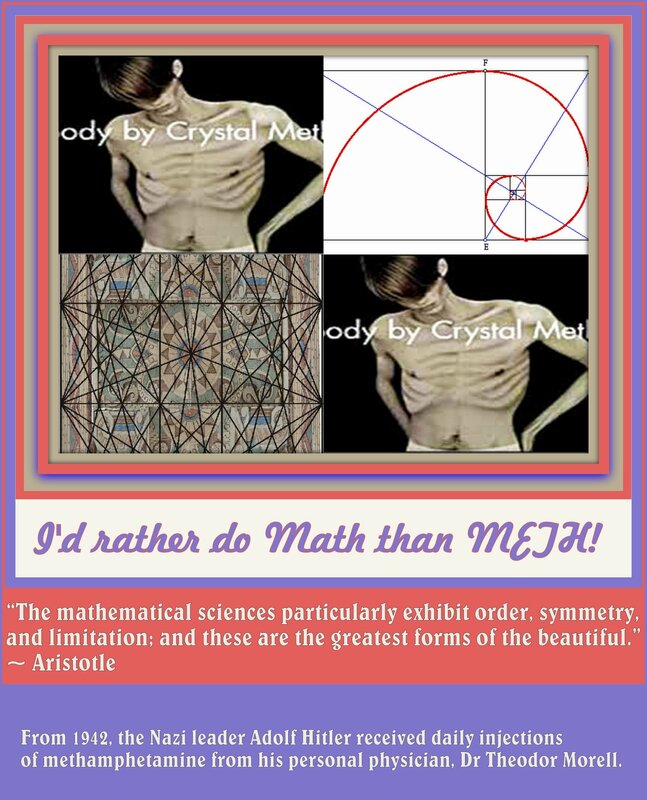 one of my favorite math beauties….